Coaching can mean different things, depending on the context. Most commonly, perhaps, we think of coaches involved in guiding athletes toward better performance. But let’s define coaching as a conversational process to support a friend, employee or colleague. 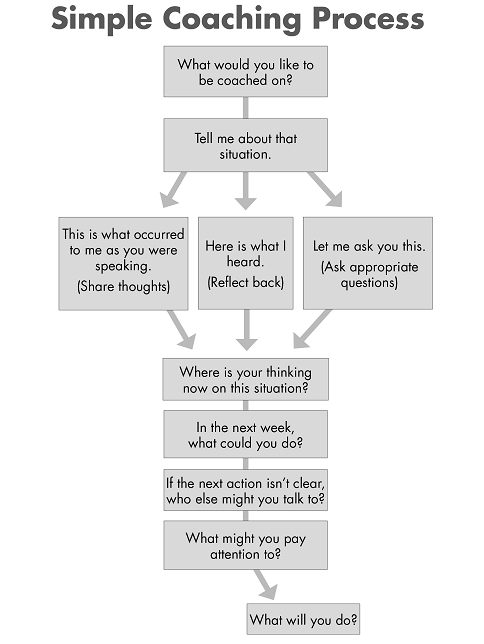 In the process, the most effective coaches also benefit from the conversation. People are usually able to resolve their own problems if given the space and encouragement to think and talk about them. The most important piece to remember as a coach is that your job is to listen, not to give advice. Any advice you might offer comes from your own history and is therefore not likely to be useful in the other person’s reality. People are usually able to resolve their own problems if given the space and encouragement to think and talk about them. When can coaching be helpful? To find a path forward from a problem: Many of us think we can sort out problems on our own. Well, that’s possible, but it’s definitely slower and often less effective than working through it with another person. What is it that you are committed to that makes this a problem? Where do you want to be at the end of this conversation? Life is full of problems. Good people and good projects have their share of them. Perhaps it’s a poor performance review or being passed over for a promotion. A coaching conversation can speed up the process of clearing out negative thoughts or feelings and deciding on a constructive path forward. To clear out worries or concerns before an event: You and I are not at our best when we have a background conversation happening in our heads. When athletes are playing at their best, they describe being “in the zone” or playing “out of their minds” – that is, they are not doing much thinking. University of Chicago researchers found that students who clear their minds of anxiety before exams do much better than students who don’t. Is there anything at all making you anxious or concerned regarding this event? Okay; is there anything you need to do something about, or can you set these concerns aside and perform? If a colleague has an upcoming presentation or must have a difficult conversation, offer your support to help clear concerns before the event. To push an idea to the next level: The fastest way to develop an idea is to share it. Coaching is not just for problems! One person speaks while the other listens and takes notes. The listener holds all thoughts and questions until the speaker asks for them. Once the speaker can’t think of anything else to say, the person listening shares insights, reactions, ideas and questions. Together, the conversations goes where the energy takes it. Lastly, the speaker shares the value generated by the conversation. The fastest way to develop an idea is to share it. Coaching is not just for problems! What makes someone easy to coach? Formal coaching relationships with trained coaches are wonderful. Having a trusted friend or colleague to listen to you and work with you in a special way is often just as powerful. Working within a coaching relationship can help us perform at levels we just can’t reach on our own. Paul Axtell is a corporate trainer who is focused on individuals and groups being remarkable. The author of two award-winning books, “Ten Powerful Things to Say to Your Kids” and “Meetings Matter,” Paul also has developed a training series, “Being Remarkable,” which is designed to be led by managers or HR specialists.